East meets West in the Deep South. An overcrowded maximum-security prison - the end of the line in Alabama's correctional system - is dramatically changed by the influence of an ancient meditation program. Behind high security towers and a double row of barbed wire and electrical fence dwells a host of convicts locked away from the outside world, many for life. But for some of these men, a spark is ignited when it becomes the first maximum-security prison in North America to hold an extended Vipassana retreat, an emotionally and physically demanding course of meditation lasting ten days, nine in silence. 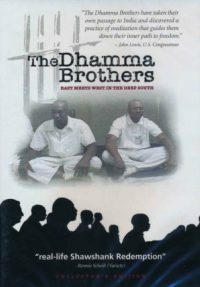 The Dhamma Brothers tells a dramatic tale of human potential and transformation as it documents the stories of prison inmates at Donaldson Correction Facility who enter this arduous program. This film, which dismantels stereotypes about men behind prison bars, "gives you hope for the human race." in the words of Sister Helen Prejean (Dead Man Walking;). The book Letters from the Dhamma Brothers contains letters written during a four-year period after this course by 15 inmate-meditators. The letters offer direct and intimate access to their thoughts, struggles, dreams and triumphs after taking part in this intensive, voluntary program. Corrections officers, wardens, judges and others ask: "Can this program really reform such hardened inmates? Will the changes last?" These letters will help you decide for yourself if their transformations are real or not. Collector's Edition Includes: feature length film, one hour of never-before-seen footage including personal conversations with the Dhamma Brothers, their families, and the meditation teachers about their lives in prison and Vipassana practices and digital widescreen presentation of the theatrical trailer. If you missed it, you can own your own DVD of the movie in an expanded Collector's Edition. The Collector's Edition contains the feature length film, an hour of extra footage including personal conversations with the Dhamma Brothers, their families, and the meditation teachers about their lives in prison and their Vipassana practices. It can also be seen with Spanish and English subtitles, if wanted. The movie records the dramatic changes that prisoners experience as they attempt to purify their minds of hatred, fear, greed, anger, etc., that have landed them in prison. This DVD makes it clear that the impurities they carry deep within cause suffering both to themselves and to those around them; and whatever relief they get using the meditation helps both them and others. The question remains: How effective is this program for the convicts over time? That's difficult to say since each individual must try to integrate his/her insights into an environment that may be dysfunctional. But there are indications of overall success. For example, watch a five-minute YouTube video entitled: The Dhamma Brothers Update: Finding Peace in Prison - Super Soul Sunday - Oprah Winfrey Network. When you watch the film, do not exit while the credits at the end are still scrolling. At the end, one of the Dhamma Brothers is discussing how a fly terrorized a group of convicts who were meditating. They then began to speculate on the behavior of the fly, and then began to philosophize about it. It brings a smile.